View basket “Music Box” has been added to your basket. The Fuzzy Dreams demo comes courtesy of our talented friend Zach Heyde. You can hear more of Zach’s work on his website here. String sounds from the dusty past • Unique single-dial “Vintage” control for simple but powerful timewarping • Combined acoustic string section and electric string synth for a wide sound palette • Vintage “Icon” reverb to add gloss and shimmer • Clean, soaring strings or crusty, erratic warbles… you choose! Strings have a unique ability to bring warmth and richness to music: there’s something about dozens of individual players melding into one sweeping soundscape that just seems to lift the hearts of the listeners. 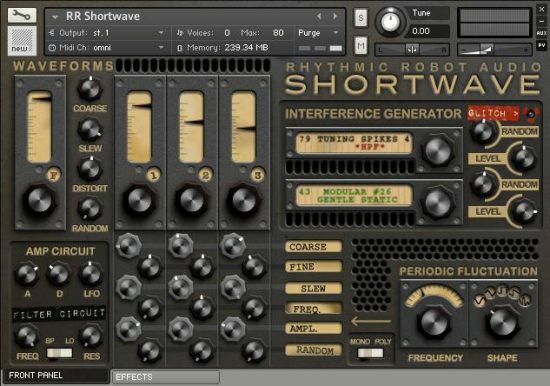 Of course, not every rock star is in the position to hire the London Philharmonic to score their album; hence the rise of the string synth – which replaces dozens of individual players with dozens of detuned oscillators to approximate the same richness of result. 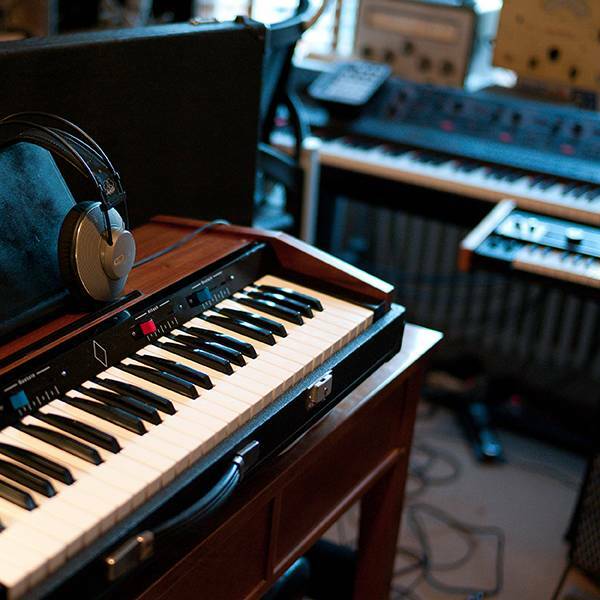 String synths are one of our favourite musical machines – and Vintage Strings is a homage to them. 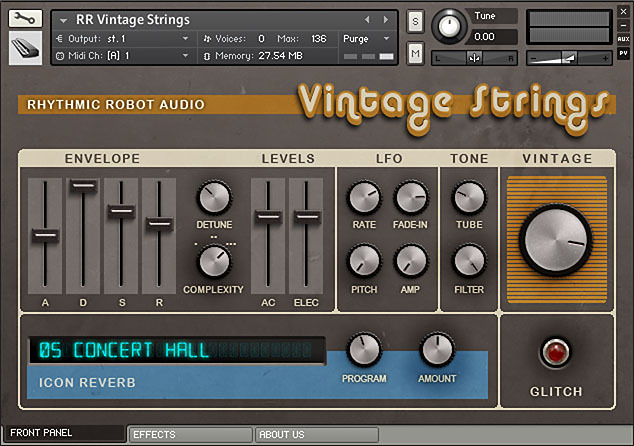 At its core, Vintage Strings has both acoustic real-world string samples and electric string synth oscillators. You blend the two to your own taste using the Levels controls in the centre of the panel. 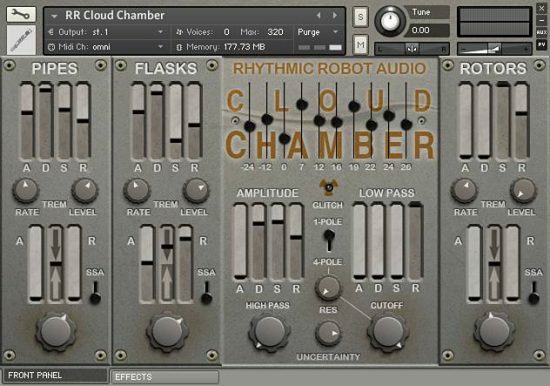 You’ve also got a fully-functional LFO, control over tube saturation, and a gentle low-pass filter to adjust the tone of your hybrid string section. So far so good. Where things get more interesting, though, is with the two signature controls: Complexity and Vintage. Complexity dials in further electronic string components, adding two levels of Jupiter 6 supersaw to the initial Logan String Melody II waves for a thicker, warmer sound (which you can take still further by detuning it a little). Vintage, meanwhile, is an unmissable chunky knob in its own little area, and cranking this changes the whole character of the instrument – from clean and clear through to dusty, crusty and erratic, taking in all manner of battered instability along the way. 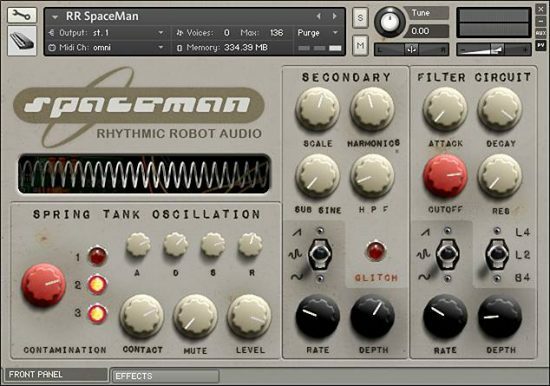 With Vintage at its minimum, you can use the other controls to sculpt a superb modern string section combining acoustic realism with synth expanse – or stick to one or the other for more precise sounds. 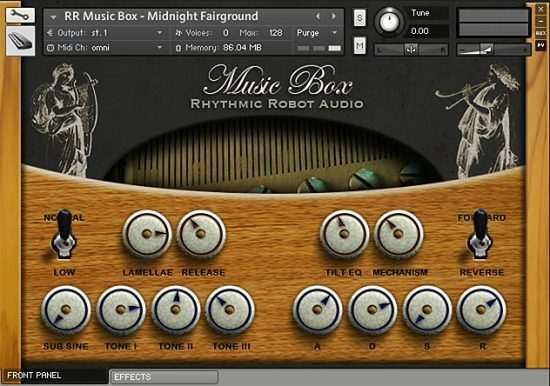 But with Vintage at anywhere past the 12 o’clock position, the sound becomes unstable; the clean acoustic string samples are blended with, and then replaced by, vintage tape-based string recordings – while the electronic strings become uneven and compressed and start to lose both high- and low-frequency elements. With Vintage all the way clockwise, the sound is dustily aged and full of crusty oxide, with background crackle and hiss breaking through. It’s pretty awesome. To put the icing on the cake, we have the Icon Reverb – convolved from our Lexicon PCM70. This adds a wonderful smooth period-appropriate classiness to your string sections, letting them breathe. Great addition to the RR library. Simple interface but a lot of control. Hitting the glitch button works wonders. I am strung out on retro. Give me more! First off, I can’t say enough about how much I love Rhythmic Robot! They embrace creativity, customer service & conscientiousness. Now about Vintage Strings… Instant ideas flowing from this very useful instrument. I had not messed with it 5 mins b4 getting a really cool snapshot. Vintage Strings is dripping with vintage mojo, yet I think useful in many contexts. Thanks Professor & Mongo! For me, this is a real time saver. I like to blend the sound of string machines or synthetic string pads with sampled strings. It gives the strings a nice sheen and transient, when bowing. Much of the music I make has a 70s or 80s feel to it, so this string sound set is ideal. It saves me opening up several tracks and putting different string-like instruments on them, playing in unison or in octaves. I like how the Vintage knob gives just enough movement to the samples to keep them sonically interesting. The Lexicon reverb impulse responses are very nice on strings too. The best features (in my opinion) are that it saves having to replicate all of this with separate instruments and plug ins and the overall impression of the finished sounds is beautifully redolent of an earlier era. Just the ticket.